Anybody ever used a canopy mask? Are they difficult to work with? Are they worth the expense and and difficulty in getting placed correctly? 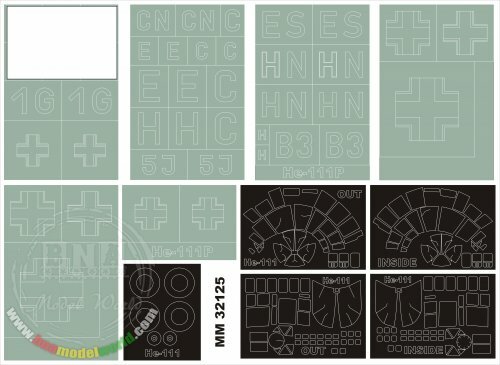 I looked at one for the 1/32 He 111 and it looked overwhelming. Getting them right on the curved and contoured parts would seem extremely difficult. I've used it on the Avenger build and it looks like it's making by the same company. You will not be disappointed as the masks fit perfectly. You do need to use/wear magnifier glass when doing it, and lot of patience ; But the final result will be all worth it. Whenever I have used them in the past, I always applied the curved/contoured ones on by aligning the flat or straight edges to the canopy first. They will fit perfectly to the curved/contoured areas once you do that. I hope that this advice helps. Thanks for the encouragement. Sounds like they can work well. By the way I have the same masks for my Revell 1/32 He-111 too ( not build it yet ). I have masks for some kits I haven't gotten to yet, but they are certainly easier than cutting Tamiya (or other brand) tape yourself. I have the Revell Ju 88 and that one looks like less fun than the He 111 so I probably will get masks for it. Masking canopies has proven to not be fun. Still better than working with teeny bits of photo-etch, though. Masking canopies has proven to not be fun. Still better than working with teeny bits of photo-etch, though. Well, then I guess I am fortunate in having interest in neither 1/48 nor WWI subjects. Well, being impatient sometimes and using what I have laying around; I've just used masking /painters tape. Over the past year I've completed a HE111, JU88, Beaufighter, Misquito, and 2 ME110s. It is tedious, but it is kind of relaxing, too. Held up to a table lamp, one can see the frame outlines pretty well (usually) and gently cut with an Xacto blade. I don't do the interior of the canopy, just cover with a solid piece of tape.